Venue: Crown Moran Hotel in Cricklewood, We are pleased to welcome Honoured guests Irish Ambassador Dan Mulhall and the incoming President of the GAA Aogan OâFeargail. The next meeting London Youth Committee meeting will take place on Monday the 19th of January at 8 30pm at The Emerald GAA Grounds at Ruislip and meetings will continue to be on the third Monday of every month. 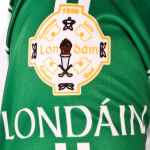 For further information on London GAA visit our website http://www.london.gaa.co.uk Follow us on Twitter @officiallondong and our facebook page Official London GAA.